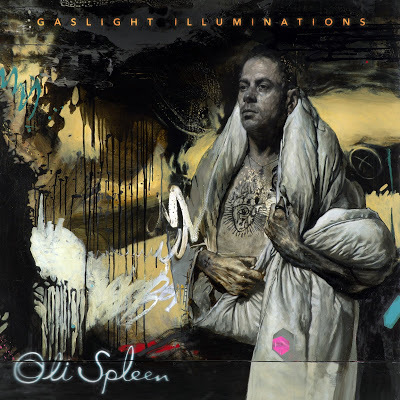 Ahead of his second studio album launch - Gaslight Illuminations - musician Oli Spleen talks to poet Salena Godden about their friendship, the inspiration behind his new music and working as an independent artist. SG: Let’s begin at the beginning, looking back can you remember your first gig and those early years and tell us a little about it please? OS: I remember meeting you when I was seventeen and how you took my bad teenage poetry seriously and would ask me to go on stage to introduce you to big London crowds. Sometimes you'd ask me to read a poem first, a prospect which was daunting to me back then. My crowd pleaser in those days was a poem about necrophilia. It was more than five years on before I formed a proper band and though I couldn't sing, your encouragement gave me the conviction to keep trying and the confidence to confront a crowd. SG: How has the landscape changed since you first started making music and writing and performing? OS: It's become increasingly harder to find decent gigs, in London particularly. Promoters don't seem to do any promoting any more, they only seem to want acts that can guarantee a crowd and how can you begin to build an audience if they won't take a chance on you in the first place? Also many great venues have been closed down. A lot of the wonderful places which my first band The Flesh Happening would play at the start of the millennium, such as The Bull & Gate in London and Hectors House in Brighton have been turned into hipster gastropubs, favouring craft ale and food served on a slate over original live music. SG: Being an independent artist you juggle so many jobs and do so much of the work yourself. What part of your process are you enjoying most, the writing, the recording, studio time with the band, or your film making, making the artwork, or the live performances or is it something else? Where are you happiest? What brings you the most joy? OS: I love being in the moment of creation and feeling the sense of achievement which hopefully lingers for some time after; be it completing a lyric, developing the words into a melody or song, seeing it come to life in the studio or realising it visually in the form of a video. All of these processes give me some sense of achievement but there is also a feeling that you can't take credit for what you have created, as Rimbaud said "I is someone else" meaning we are not fully within ourselves at the point of creation, so how can our egos take credit for it? That said I get post creative depressive slumps as well but Gaslight Illuminations has put me on a real high, I almost have to pinch myself to believe I've manifested this thing. SG: I love the haunting melodic qualities in this album. There are themes of growing older, life and death and mortality running throughout the album - Please can you tell us more about where this inspiration came from and how you approached writing these poetic lyrics and songs? OS: Some ideas within the album go back over ten years but had been put on the back burner as I didn't feel they suited the rock vibe of my bands. I really wasn't expecting the songs I chose to flow so well and reveal a greater narrative throughout the album, that only came when I thought about a running order. The idea of the songs being illuminations was inspired by notions of light and dark within Kabbalah and other spiritual teachings, it's about taking the darkness of life's suffering and "making light" of it. As for the gaslight part, I was in an abusive relationship with a toxic person, he inspired the thread which runs through songs like Gaslight and Never Known. Other tracks depict my own experiences with substance abuse as well as my own mortality. As you know I almost died due to HIV complications at the turn of the millennium. Toward the end of the album it gets extremely dark and hopeless but with the final track Furnace my spirit is reborn from the ashes. My dad died in January 2018 which kickstarted this project and forced me to confront my own mortality once again. We even used his ashes as a shaker sound, most notably on the track Ghost. SG: You are your own boss: What are the great challenges you face as an indie artist? What are the great highlights and perks? OS: For me the greatest challenge is not creating the art but selling it. When you have exposed so much of yourself and made yourself so vulnerable it's very hard to see the fruits of that process as a "product" and then to try to push for it to be heard and potentially face rejection which in light of the subject matter can feel like a personal attack and cut very deep emotionally. Then when someone does get it and gives it a platform it all seems worthwhile though the hustle to get noticed can feel utterly soul destroying at times. The main perk is when someone tells you how your music had helped or healed them in some way, that's the real pay off. Commercial viability comes second to touching people's hearts. SG: Your work is so often political, you have marched at protests by my side and you have used your lyrics to speak up for gay rights, and all human rights, please can you tell us a little bit about any of the politics (if any) behind this new album? OS: I feel that the personal is political. What we go through in relationships, how people support or manipulate one another is a microcosm of the wider political landscape. Witnessing the blame politics of the likes of Trump it seems clear to me that gaslighting is not something that just happens on a one to one basis. Governments and leaders manipulate us as well. I feel today it's more important than ever to speak out against the many injustices of the world if you have the strength to do so. Some days it all seems so overwhelming to me that I don't feel as though have the energy to fight. I guess in a sense the album is about retaining your sense of individuality and not letting the bastards grind you down. To be openly and defiantly yourself is in itself a political act. If that makes me a snowflake then I'm damn proud to be one! SG: Last question: Who would you most like to work with? What would be your dream gig or collaboration? OS: Well it's on the cards to duet with you which has been high on my list for some time.... are we saying living or dead? Dead would include the French chanteuse Barbara, Nina Simone or maybe Leonard Cohen. Living perhaps, Janis Ian, Benjamin Clementine or Kate Bush, maybe a music video featuring the cast of Fraggle Rock? ... I can but dream. You can listen to Gaslight Illuminations online here. Or head down to Brighton’s Hope & Ruin on Saturday 9th February to watch Oli Spleen's Gaslight Illuminations Band launch their new album with support from Birdeatsbaby, Hana Piranha and Pink Narcissus. Support Oil on Patreon or follow him on Facebook or Instagram.